The elk (Cervus canadensis) to this day remains an icon of what once was the unsettled, untamed American frontier. There are four extant subspecies of elk in North America. The Manitoban elk (C.c. manitobensis) is exclusive to Canada, but the other three subspecies can be found in California. They are the Roosevelt elk (C.c. roosevelti) of the north coast rainforests, Rocky Mountain elk (C.c. nelsoni) of the northeastern counties, and the tule elk (C.c. nannodes) native to the Central Valley. 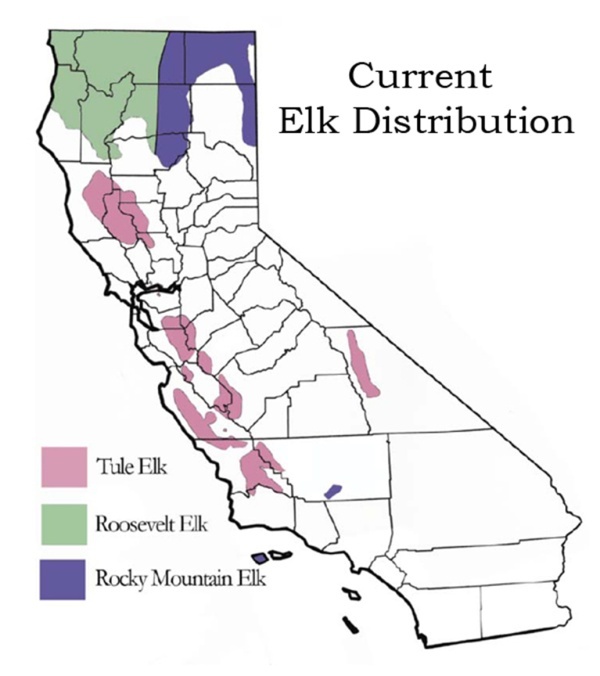 Elk distribution in California. 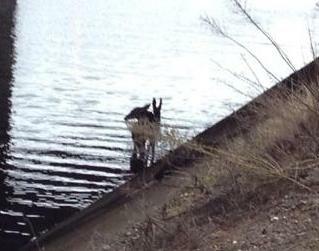 Photo courtesy of the DFW Elk Management Program. Tule elk look similar to other elk in general size, shape, and color (albeit tules wear a slightly lighter brown). Generally speaking, however, tule elk are overcome in maximum size by both Rocky Mountain elk and the great Roosevelt elk. A good sized Roosevelt bull, the largest of the subspecies, can reach 1,000 pounds or more. Tule elk are the smallest subspecies; in fact, at one time they were colloquially referred to as ‘dwarf elk’. A large bull tule elk will tip the scales at about 700-800 pounds (hardly a ‘dwarf’ by any means), yet under ideal conditions they may grow larger. Tule elk once roamed the San Jaoquin Valley in ample numbers. Early settlers found tule elk roaming the foothills of the Sierra Nevada west to the central Pacific coast and from the headstream of the Sacramento River south to the Tehachapi Mountains. Much like the affliction of the American bison on the Great Plains, tule elk became a casualty of human settlement — particularly after the Gold Rush. Unregulated market hunting, competition with livestock, and the introduction of nonnative plant species all contributed to the decline of tule elk. What was more devastating, however, was the conversion of elk habitat to agricultural land. When settlers turned to the plow not only did it remove food and cover resources for elk, it also brought about direct conflict between elk and farmers. Increasing crop and fence damage fueled campaigns for the removal of the tule elk by those individuals whose livelihoods were affected. By the time elk hunting was banned by the state legislature in 1873, it was unknown if any tule elk even remained. Luckily tule elk did remain, thanks in part to the protection provided by California cattle baron Henry Miller. In 1874 a pair of Tule elk was discovered on the Miller and Lux Ranch by a local game warden at Button Willow. Miller set aside 600 acres (near present day Tule Elk State Natural Reserve) to give the elk a chance to rebound. 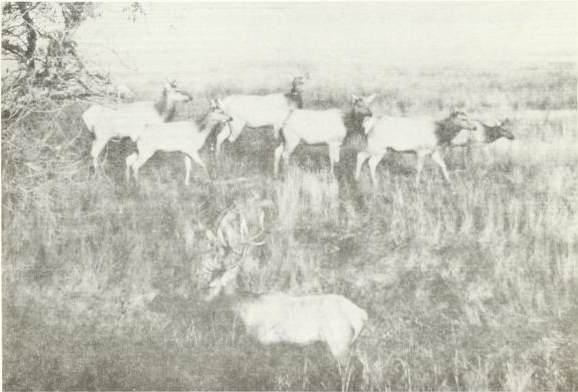 In 1914, the elk had experienced such growth in numbers that Miller requested the California Fish & Game Commission work to relocate the elk from his ranch. 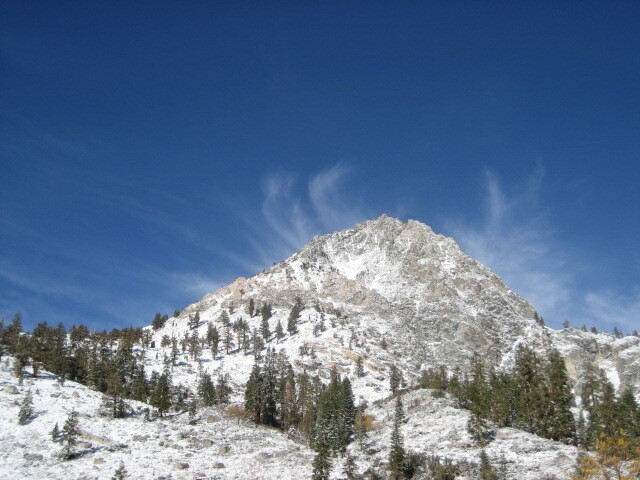 In order to relieve Miller from elk damage to his property and crops (reportedly estimated at $5,000 per year), the U.S. Biological Survey attempted to relocate tule elk by lassoing them from horseback and transporting them to new areas, with little success. From 1914 to 1934 the California Academy of Science took on tule elk relocation activities 21 times over the next several decades. 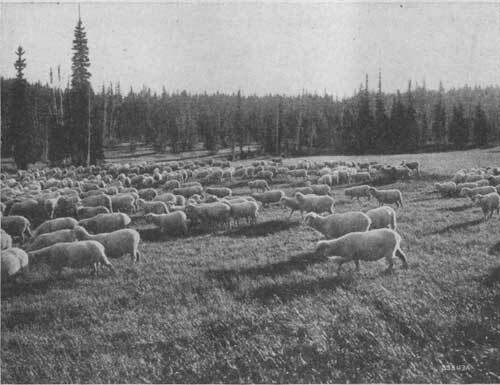 These attempts were not very successful either, although they did contribute to establishing the herds at Owens Valley, Cache Creek, and the Tupman Reserve. From 1971 through 1989 complete species protection was granted to tule elk. State and Federal laws were passed to prohibit hunting of tule elk until a population of at least 2,000 was reached. 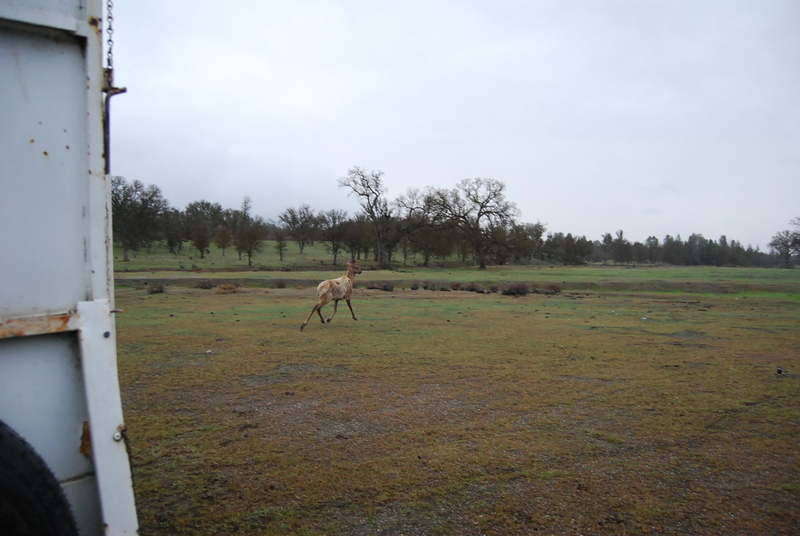 Habitat improvement programs combined with an aggressive reintroduction campaign by the Department of Fish & Game and other state and federal agencies yielded a significant increase in California’s tule elk population. Tule elk of the San Luis National Wildlife Refuge, cca the 1970s. Image source: BLM 3rd Annual Report to Congress on The Tule Elk, March 1, 1979. Today there are twenty-two tule elk herds in the Golden State, totaling around 4,200 individuals with the population trending upward. 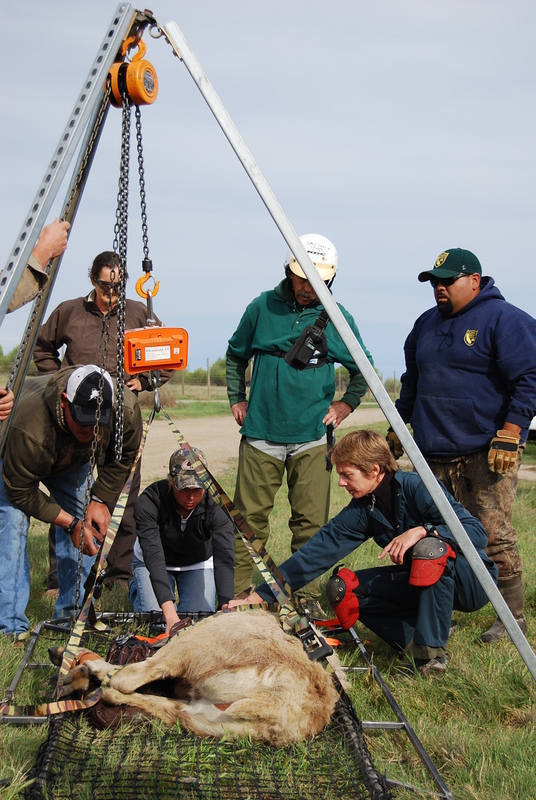 Dr. Annette Roug (front right) leads a team of biologists as they attempt to weigh a cow elk. Photo credit: Joe and Nancy Rodrguez. herds. Removing elk from one herd and placing them in another helps to simulate the natural movement of individuals between herds which increases genetic diversity, an important function of a healthy population. 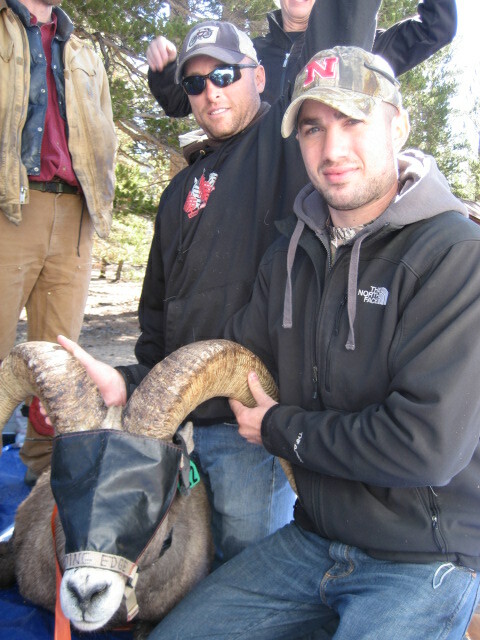 The Wildlife Investigations Lab took part in one such capture and relocation effort at the end of March. 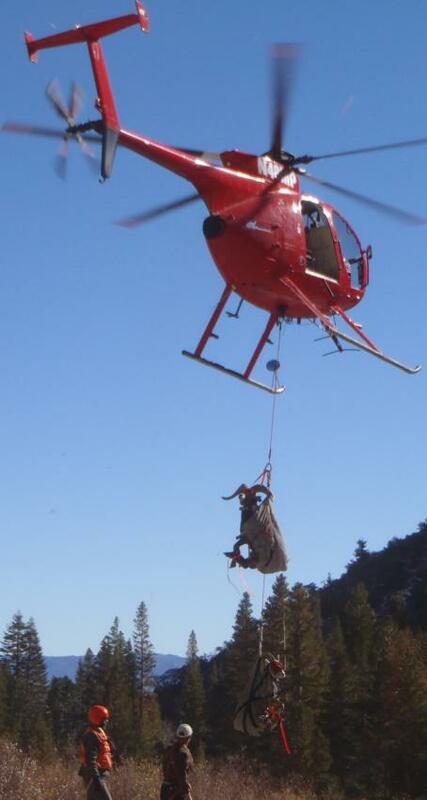 A total of 36 elk were captured via helicopter from the San Luis National Wildlife Refuge near Los Banos. 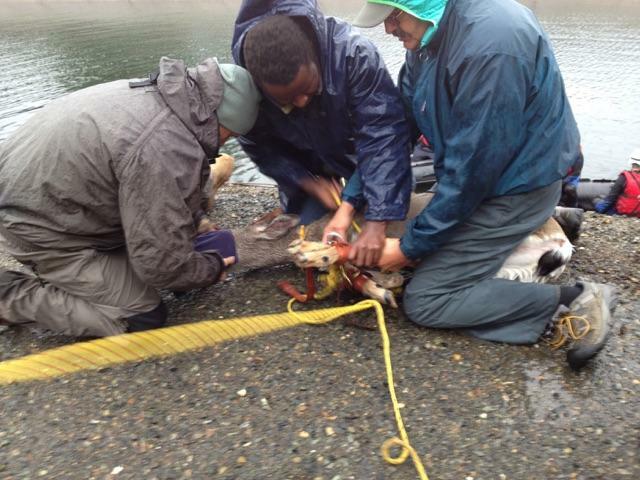 Once elk were netted from the helicopter, they were processed by capture teams. 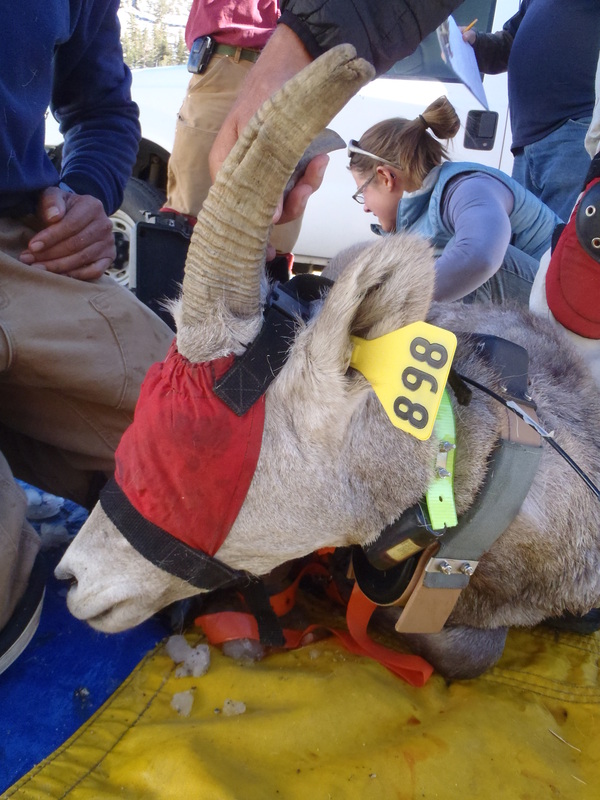 Capture teams took measurements, collected hair, blood, and other biological data to assess the health of the herd before they moved on to their new locations. The animals were successfully released to join their new herds. 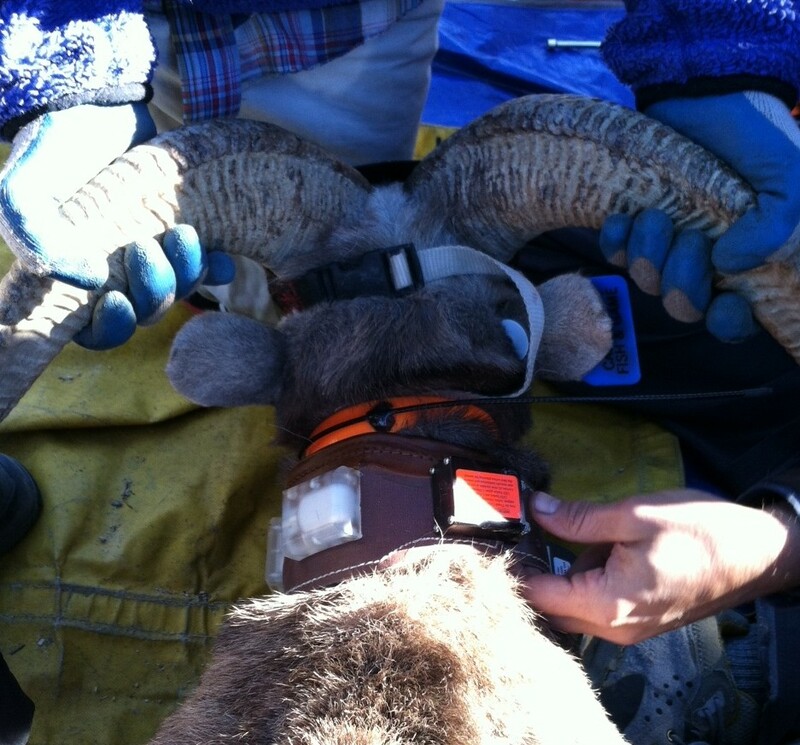 A portion of the captured animals were also radio-collared to collect post-release movement information. An elk sets sights on joining its new herd. Photo courtesy of Joe and Nancy Rodriguez. 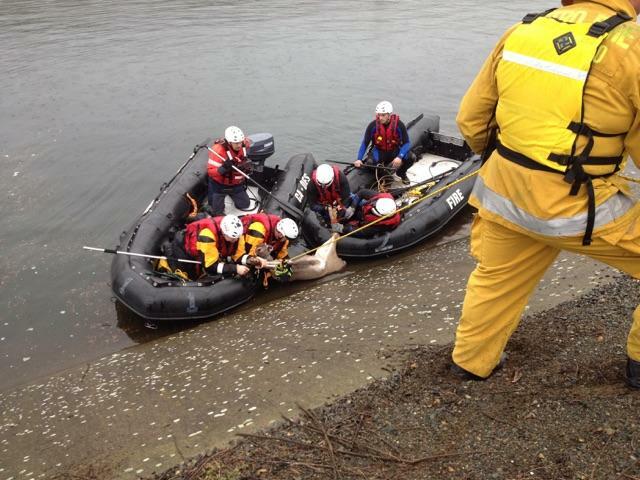 To read the CDFW news release from this successful capture, click here. 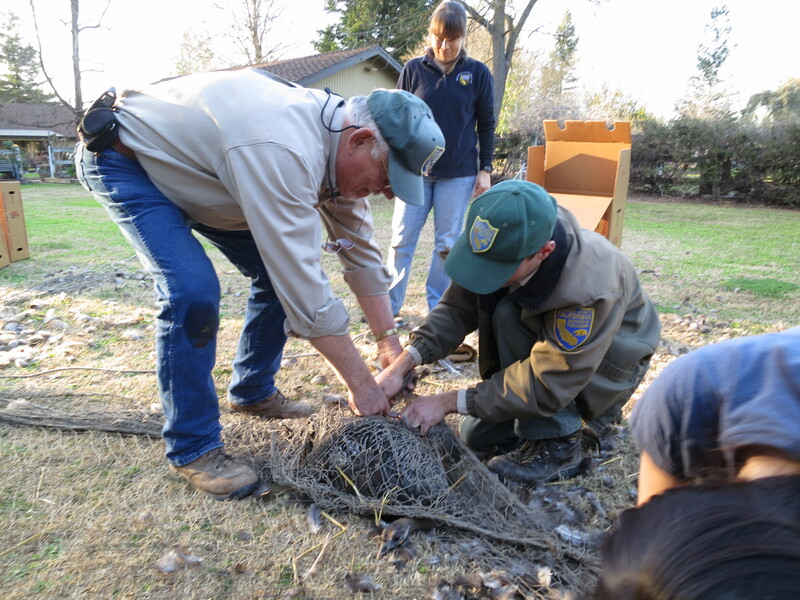 For more information on the CDFW Elk Program, click here. 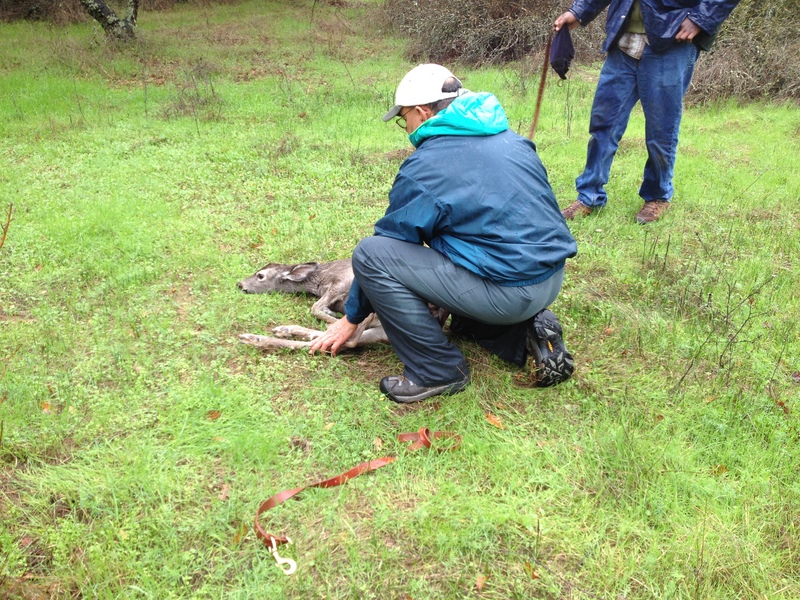 Interested in more tule elk biology? Click here. Two turkeys feed in a residential area. Photo credit Matt Meshriy. The wild turkey (Meleagris gallopavo) is a wide-ranging upland game bird of North America. There are five distinct subspecies of turkey, four of which have been transplanted into California at one time or another. This includes the Eastern (M.g. silvestris), Rio grande (M.g. intermedia), Merriam’s (M.g. merriami), and Gould’s (M.g. mexicana) wild turkey. Today the most common subspecies found in California are the Rio grande and the Merriam’s varieties. Wild turkeys were first introduced into California on Santa Cruz Island in 1877 by private ranchers (although there may be evidence that a turkey species existed in California as recently as the Pleistocene epoch). Ranchers released these turkeys into the wild to have a supply of game birds readily available. Throughout the early 20th century, introductions occurred several more times without a lasting effect. The California Fish and Game Commission first purchased birds from Mexico in 1908 and released them into the San Bernardino Mountains. Over twenty additional turkeys were farm-raised for future game-stocking purposes. Between 1928 and 1951 these farm-raised birds continued to be released until the program’s termination due to lack of success. During these twenty-three years, only three populations were successfully established. It wasn’t until after 1959 that turkey populations began to take flight. A new management tool aided the propagation of the wild turkey in California. The cannon-net trap was developed around this time, which increased trap-relocation feasibility and efficiency. The cannon-net is set over the food plot, ready to capture turkeys at the push of a button. Photo credit M. Meshriy. 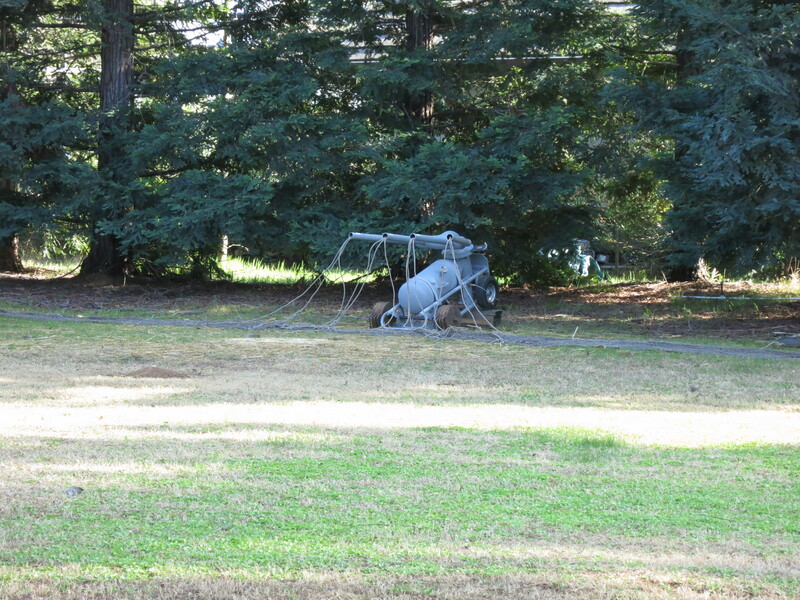 The cannon-net trap – a close relative of the “rocket net” – was utilized to increase wild turkey populations for sporting purposes in California. Ironically, today cannon nets are typically used to catch and relocate turkeys that present problems for landowners, farmers, golf courses, and airports, among others. 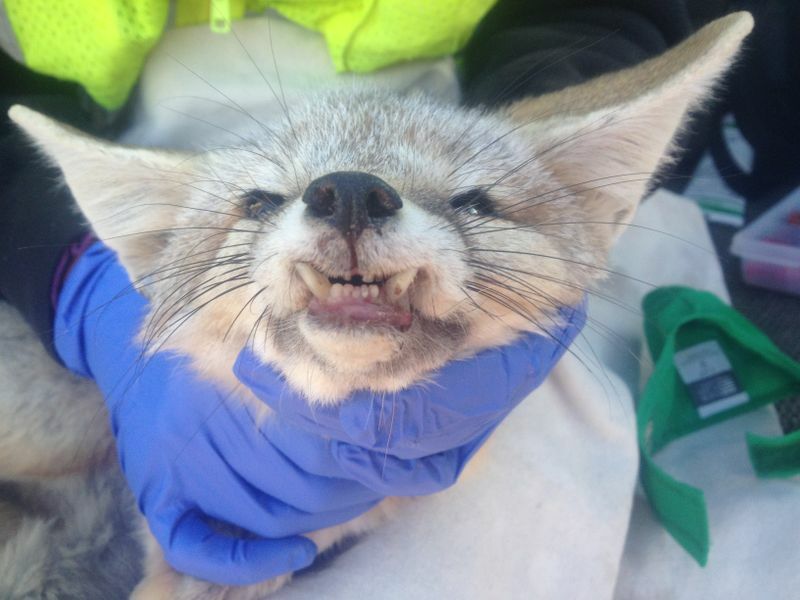 The WIL recently took part in such a capture-relocation. 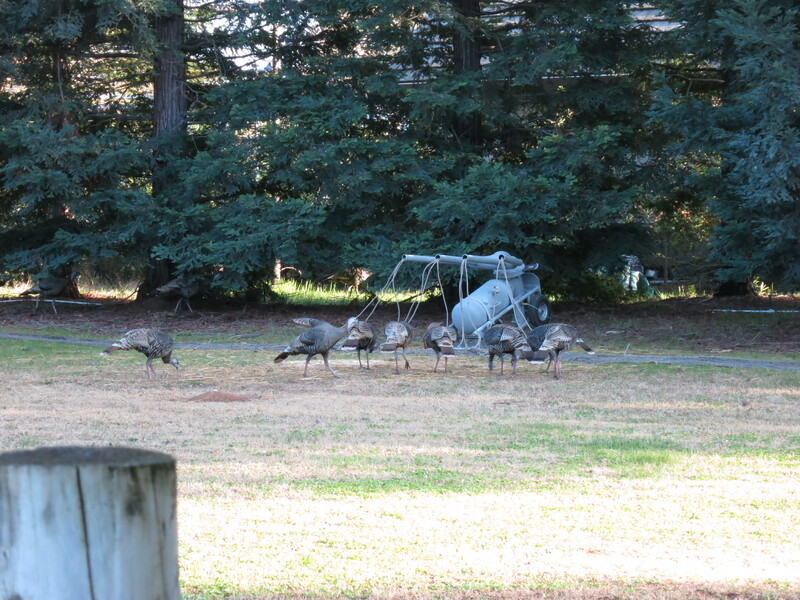 Homeowners in a rural residential area near Elk Grove contacted CDFW for help with a nuisance turkey situation. CDFW officials assessed the situation and determined that relocating the turkeys to public wildlife areas was the best option. 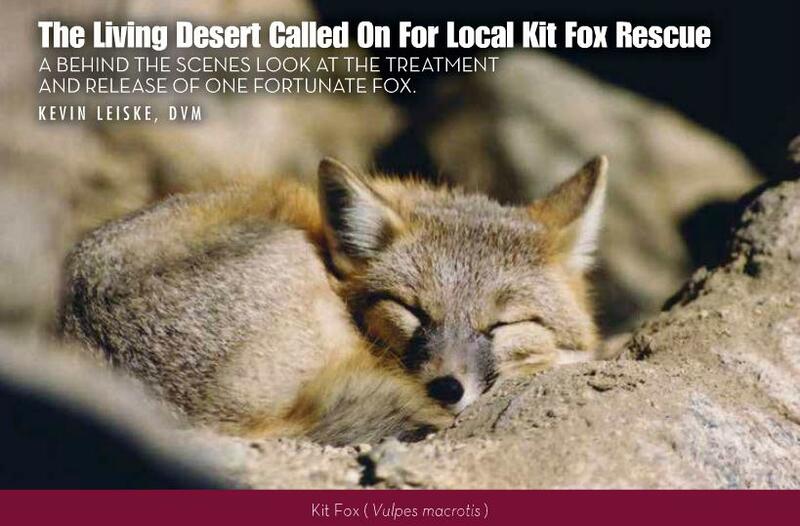 Factors considered by CDFW officials include: feasibility and probable success of the trapping effort, the safety of the public, the proximity to a suitable release site, and the availability of appropriately trained staff. Turkeys are very vigilant creatures. Living in a group puts more eyes on potential threats, and they will scatter at the slightest indication of danger. So how do we lure turkeys in? The answer is through a healthy dose of patience. The first step is to determine where the turkeys in question go at certain times of the day. Once their travel patterns can be predicted, bait is placed in a spot that is favorable to them as well as for the net and cannon — a cardboard mockup at this stage. 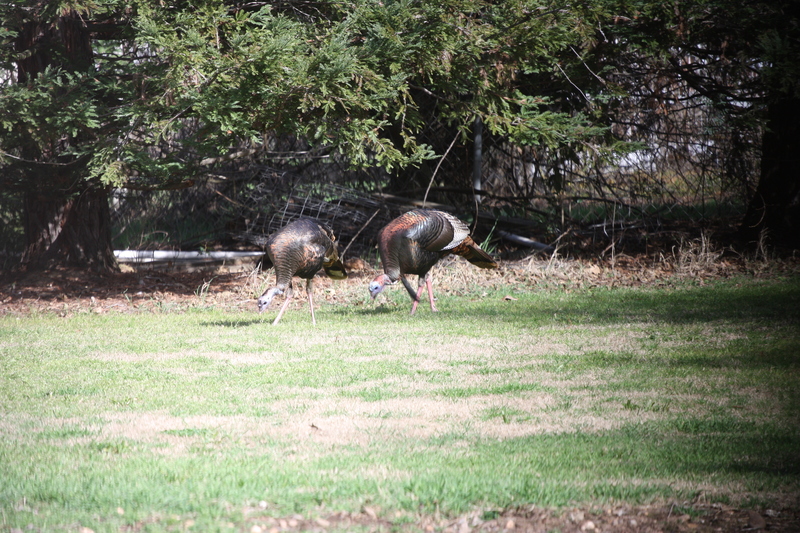 Bait is set for up to a week or more so the turkeys become aware of the food plot and habituated to the area. Once the flock takes to the bait, the real cannon and net are substituted for the fakes, the rocket is charged and ‘live’, and a waiting game begins. A group of hens feed on the food plot in front of the rocket net. This is a good capture opportunity. Photo credit M. Meshriy. Once there are enough birds on the bait to make processing them worthwhile (rarely is a second shot possible), and no birds are in danger of harm from the net, the cannon can be fired. Field crew members quickly sprint to the birds under the net and physically restrain them to prevent injury. Turkeys are transported back to the lab in specially designed carrying boxes. WIL Environmental Scientist Krysta Rogers gets a transport box ready while Turkey Capture Specialist Bob “Turkey Bob” Klotz and Upland Game Biologist Levi Souza remove captured turkeys from the netting. Photo credit M. Meshriy. When they arrive at the WIL, the turkeys receive a health assessment, a leg band and blood is collected in order to test for disease. Once they are pronounced healthy, the turkeys are released into their new home. 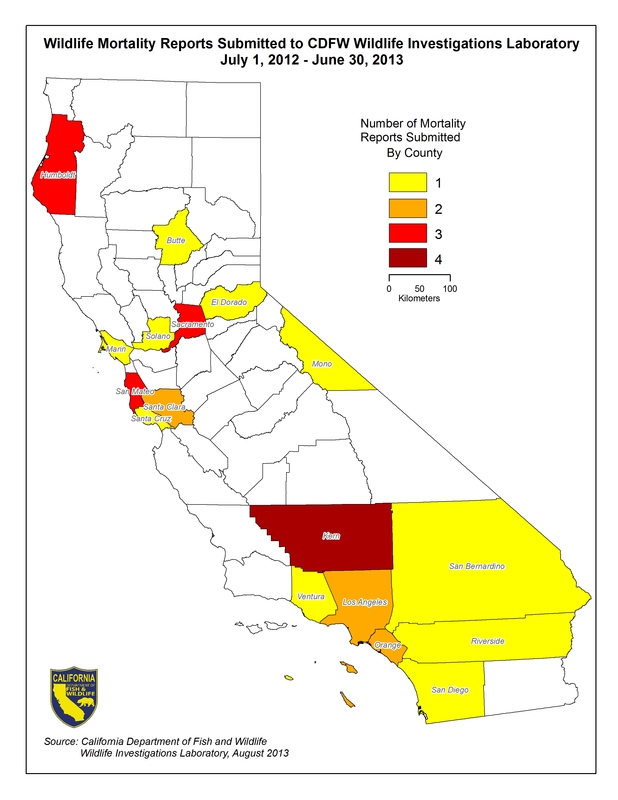 CDFW’s policy is to only release turkeys in areas away from human habitation, where there are already established populations and where they will be available for public enjoyment. For more information on how to avoid conflicts with wild turkeys, click here. For more information on the wild turkey’s life history, click here.